15 December 2008: A Pampan pilot photographs two strange objects in different positions at the border between the provinces of Buenos Aires and La Pampa using a cellphone. 8 December 2008: Witnesses at Ataliva Roca see a powerful red light toward the west, oscilating under cloudy skies. 16 December 2008: A luminous triangle flies over Santa Rosa in a SE-NW heading. Object was sizeable and well-defined. 16 March 2008: UFO photographed in seen in Santa Rosa and photographed over General Pico. 10 January 2008: Several residents of Santa Rosa see a UFO in broad daylight, amidst a storm. 6 June 2009: Oscar "Chango" Guitierrez, a television producer, photographs a strange object as he travels along Rt. 35 from north to south, pulling over to take a photo of the sunrise shortly before driving into the town of Peru. 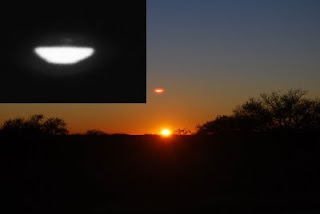 24 June 2009: Members of CEUFO photograph two strange luminous objects over Laguna Don Tomás in Santa Rosa. 13 April 2007: A photograph is taken of an entity near an airplane parked at the Macachín Aerodrome. Entity is nearly 80 centimeters tall; image was enlarged and subjected to analysis, revealing such details as parts of the body, consisiting of head (with frontal eyes), upper extremities (arms or wings), torso and lower extremeties. The photo was taken by Fabian Romano, a photographer of that locality under optimal lighting conditions (noon) using a Minolta digital camera with 135mm and a 1/1000 speed. The image was only noticed when scrutinized on a computre. September 2008: A hunter spotted a "critter" in the Pampan wilderness. "It gave me the sensation that it arrived floating, and it stopped near the stream," he said. [The entity] cause a horse to whinny and the ranch's dogs to bark desperately. The strange animal stood on four legs and the back of its neck was white, with protuberances in its head and ears the same color as the neck. The rest of the body was dark. The hunter opened fire with a 30.06 rifle, but only a small puddle of blood was found the next day. At the same place on the following day, another hunter witnessed the presence of two strange "red-eyed" beings that approached the area, making a strange sound that he compared with that of a dog's whine. It rained heavily over the area, making the recovery of blood samples impossible. January 2007: During the aerial fumigation, strange marks were seen on a corn-planted lot in the rural area of Miguel Riglos. Attention was drawn to the fact that the missing foiliage within it showed odd characters similar to rectangles and circles where other irregular figures were also in evidence. Over 20 drawings could be seen, characterized by a suggestive alignment. An initial evaluation of these marks suggests a failure of the harvesting equipment in several areas. However, some of the the figures do not contain straight-line incisions, and those resembling circles are predominant. There are also isolated irregualr shapes. The grouping of these alleged drawings is on the southwestern edge of the lot that borders the 33 KW line belonging to the provincial interconnected system. Curiously, the dispersion of these symbols corresponds to alleged and imaginary horizontal "axis lines" running from East to West or vice-versa, in the same direction as the cultivation. April 2002: The entire country was shaken by the hundreds of animals found mutilated in the fields. Despite talk of the "red-muzzled mouse", the explanation did not convince many. Furthermore, strange lights had been seen around the phenomenon. Over 700 mutilations were reported to the authorities during the first months of 2002. The majority of these cases involved bovines, althought to a lesser extent, they also included horses, hogs, wild boar, sheep and deer. The attacks became sporadic later on. Another attack occurred in September 2008 at Colonia El Indio, 20 Km from Santa Rosa. On March 28, 2009, a calf was mutilated but not killed -- an unheard-of occurence in this phenomenon. 26 June 2009: A Hereford cow is found slain in the Puelches area. Lights had been previously reported in the area and not even dogs would approach the dead animal. 21 June 2009: A mutilated dog was found by an official of the Agustoni commune. The animal's head and some vital organs were missing, but no trace of blood whatsoever was found. There are people who speak of attempted abductions. However, this case involves a policeman who vanished for 18 hours and was found later in a state of shock, lying in a fetal position some 40 km away from the place he was last seen. "Tests were performed, and he was evaluated by psychiatrists from Santa Rosa and Cordoba, who ascertained that the young man had undergone a powerful experience," said Quique Mario. "During part of his testimony, he said that he could see the country side from above and in little squares, giving the impression that he had been flying aboard something that flew over the area. He described things that we later ascertained were real. For example, he described parts of the La Barrancosa ranch that can only be seen from above. He remained idle for a year, but later rejoined the police force in the Communications area. His poor health prompted authorities to grant him early retirement. The event resulted in a court case that was given to Criminal Court No. 4, under Judge Luis Abraham. "The judge is willing to discuss the subject from a legal standpoint, as there are details that still lack an explanation. The Judge's openness is essential when it comes to documenting and making an increasingly more detailed investigation," noted Quique Mario. Another of the notorious events of the year 2002 was the missing water from the "Australian Tanks" at the mutilation areas. Aside from the water absconded from these cattle watering tanks, there are incidents of water extracted from swimming pools in suburban communities such as Ugarte, Trenque, Lauquen, Toay, Parera, Miguel Riglos, Macachín and others. In all cases, it was determined that the water tanks did not show any abnormalities that would have caused the losses. Nor were any spills detected in the areas surrounding the tanks. In most cases, mutilated animals were found in the vicinity. And in several cases, local cattlemen reported seen "strange lights" nearby.